You can be sitting on the next Oscar winning film, but if no one knows about it, all your hard work will be for nothing. This is why filmmakers and producers use an EPK template. What is an EPK for a film? Short for “Electronic press kits,” EPKs provide a sizzle for your film, showcasing you to distributors, producers, or potential investors on crowdfunding pages. While everyone today has a film EPK, not everyone knows how to make them effective. It’s easy to get lost in the stack film festival press kits with only the essentials. To learn how to make a press kit that gets phone calls, we’ll cover what goes into an EPK and look at successful epk samples. Scroll down to download our free EPK template for film to give your project impact. 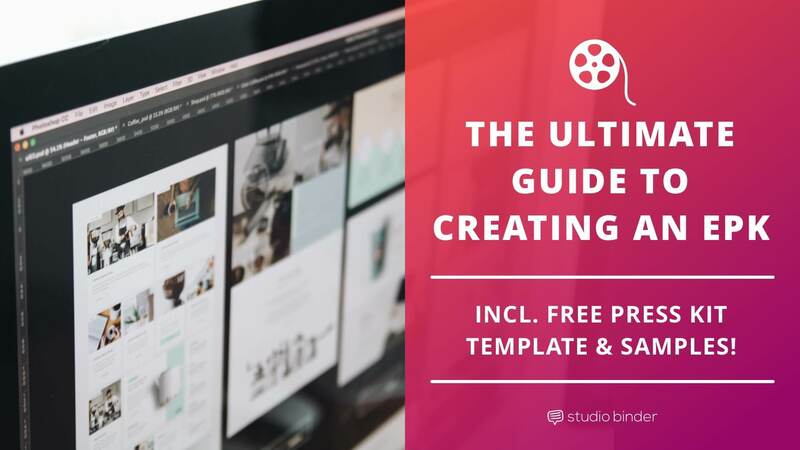 Download your FREE ​EPK template for film. While music videos, politicians, and OTHER THING all have EPKs, film and tv EPKs stand in in a class of their own. Your film EPK is a snapshot of your film, it communicates the essence of your film and all the filmmakers involved in the process. Obviously how much focus you give to each of these components depends on the scope of your project. Is your screenplay about a controversial topic? Did you win the Emerson College Film Festival? Does your film star a important British actor? Is it Colin Firth? It’s Colin Firth, isn’t it? A great film has its own vibe, breathing fresh air into the marketplace. The same goes for EPKs. Use the "Our Story" section on our free EPK template for this section. When developing your EPK, put your project's angle front and center in the first two pages. There are plenty of stories about love, revenge, and giant robots. Figure out your production’s hook. You have to include a film synopsis in your movie EPK, but how much plot is too much? Some blogs advocate having three film synopses: a short one (half a page), a medium one (three fourths), and a long one (a full page). Some movie EPKs will list all three. We’ve found that less is often more and giving just enough to perk interest can lead to another conversation where producers and distributors can just ask for more information or ideally the film itself. You won an award? That’s great! You made up an award? That’s, um, sure. No matter what great things you have to say, nothing sets your project apart than a ringing outside endorsement. Listing awards is how to make a press kit 101. If you’ve been lucky enough to get lots of praise, be sure to emphasize the more important critic or festival than say an unknown publication with something nicer to say. If you’ve been raking in serious awards, a long list looks impressive. Most EPK examples lead with their awards on the front page. Follow along with our movie press kit template which provides a unique page for reviews and praise. Often you’re so focused on getting through the shooting schedule, that the film’s release is the last thing on your mind. You won’t begin to compile your EPK until the film’s wrapped. By developing your EPK and having one for all stages of production, you keep a constant media presence. It’s better to hype your film from it’s origin rather than start to publicize it after everything has wrapped. Often times you’ll kick yourself after the production’s wrapped, wishing you’d interviewed the director before she’s busy working on her next project. Most every EPK features stills from your production. Photographs can be used to send to blogs when you promote your film. There’s endless possibility. By hiring an onset photographer, or in the case of a low budget film, grab pictures yourself. A great place to find photographers is on Film and TV Pro or ProductionBeast. 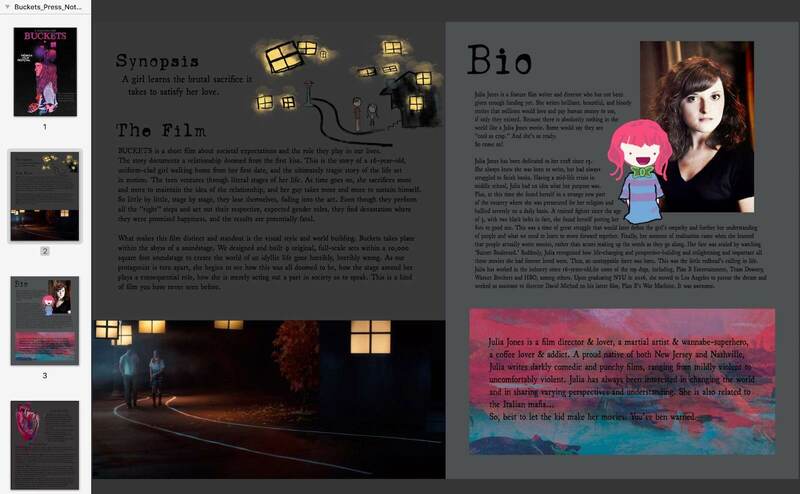 While you should have a paper version of your film EPK, your digital EPK offers the chance for more engagement. Hyperlink often to create a seamless experience for potential distributors. Distributors should be a click away from emailing you or reading more about your production and filmmaking process. 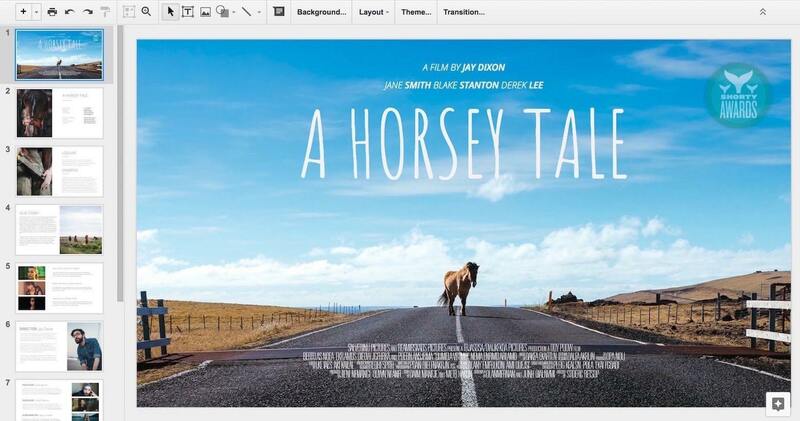 Embed a trailer to your film whenever possible. Next to your EPK, your film trailer should be your greatest asset in selling your film. Your director, screenwriter, producers, and leads are a must, but when comes to the rest of your cast and crew: use discretion. You only have so much space to pitch your movie. Beyond your essentials, only feature crew members with previous screen credits or impressive award wins. On that note, when presenting collaborators who don’t have previous screen credits, be sure to find an interesting angle that makes them stand out. Earning awards, attending prestigious colleges, or having a personal connection to the work can distract from a lack of screen credits. You can’t make a film without watching countless films before. The same goes with EPKs. Before tackling our EPK template, familiarize yourself with EPK samples that have found success for others. The Tribeca film festival has an excellent library of EPK films, but instead of sifting through them yourself, we’ve picked and analyzed standouts below. Buckets (2017) wears the production’s story on its sleeve. It doesn’t waste time with a overly complicated synopsis, instead boasting what made the film different. The EPK emphasizes “visual style and world building,” boasting that they designed and built original sets as their angle. Where There’s Smoke (2017) has the best bios of the Tribeca short film press kit examples. For the lead actors, it only lists their top credits, establishing credibility quickly. While the director/co-writers don’t have many professional credits, they instead hammer home the various awards they’ve won, their NYU Tisch educations, and future work. What is an EPK other than written trailer? It tells distributors how they should market your film. It should give agencies a million different ideas of how to bring your film into the marketplace. Boyhood (2014) is about as thorough as a film press kit can be. A whopping 42 pages (20 are credits), the EPK plays its gimmick of shooting the same actors over several years well. By spending pages outlining the characters and cast, we appreciate the process way more. Devil’s Gate (2017) features a cast of big name stars and an experienced crew. The movie EPK uses this to its advantage using most of its space to list out the movie credits of all the major players involved, while only dedicating one page to what the film is actually about. Documentary press kits often have the luxury of a big name star: namely, their topic. Whether it’s about a historical figure or a hot button topic, successful documentary press kits play this angle. 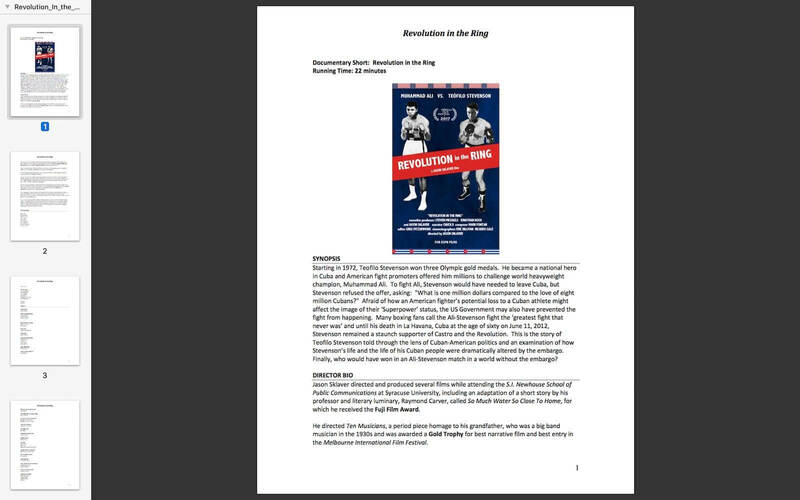 Revolution in the Ring (2017) focuses on a Muhammad Ali fight. Free of slick design, this movie press kit template grabs our attention with a synopsis of the historic events at play. Grabbing our attention with a figure we know, it pivots into a call to action, but presenting questions the documentary will answer. At the end of the day, an EPK is a lot like film production insurance. The earlier you get it, the better. An effective EPK is not only a marketing tool for distribution. If done correctly, a movie EPK can help acquire funds and other talented people to join your production. What strengths do you need to play up in your film EPK? Let us know in the comments.